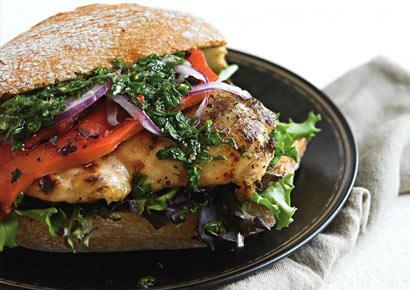 Spice up your usual grilled chicken sandwich with easy to make Chimichurri Sauce! This beautiful sandwich goes together quickly and is bursting with savory flavor. This recipe makes a sandwich that is only about 300 calories with a full 32 grams of protein. That’s pretty awesome for such a tasty sandwich. The original recipe calls for a large boneless chicken thigh per sandwich at 8 grams of fat, but I prefer chicken breasts which are even lower in fat. The amount of chicken you put on the sandwich also makes a difference in protein, fat, and calorie levels. Still, chicken breast is a pretty good bargain in those categories. At least 30 minutes before you grill, make the Chimichurri Sauce. Microwave 1/2 cup water + 1/2 teaspoon salt in a bowl for 30 seconds. Slowly add 2 Tablespoons olive oil while whisking. Put in refrigerator for at least 20 minutes. This sauce will last in the refrigerator for 3 days. This sandwich is even tastier when eaten outdoors. Great with a tall glass of iced tea or your favorite cold beverage. Enjoy! Click on any label below this post for more easy healthy recipes.